If you want to release your stress before your wedding then you can try out a few bridal makeup games. It may help you a lot. Wedding planning can be stressful and hectic. However, in this age of technology and modernity, where help is at our fingertips, you may release some of the stress and restlessness with wedding-themed games on your handheld devices. One such category of games are bridal makeup games, which combine pretend play and dress-up themes as you plan your dream wedding. So, here are five bridal makeup games that you can play to beat the heat and get ideas from, for your own bridal makeover. Get a shot at giving a makeover to a virtual bride in order to take ideas to incorporate them on your own wedding. In this game, you can be a bridal makeup artist giving a makeover to a virtual bride. You would help the bride with her make up on her big day and your work would help you in getting more bridal clients! This game would help you in the planning process of your own wedding by providing you with ideas to implicate in real life – from getting a relaxing beauty spa for both mental and physical well-being to selecting the right bridal makeup and attire for your wedding day. Furthermore, this game is quite enjoyable when it comes to building a story as by doing your work proficiently, the bride will be the happiest and recommend your excellent makeup skills to her other friends! Get a call for your first gig as a bridal makeup artist. You pack your makeup bags and other important things and then you are on your way to your appointment. You meet your bridal client and then give her a relaxing spa day for her bridal glow, before she gets ready for her own wedding. You surprised her with your excellent makeup artist talent and make her happy and satisfied with her amazing bridal makeover. Then, you help her get into her beautiful bridal gown. Finally, you watch her make a gorgeous entrance to her wedding. Learn more about it on the Beauty Girls Inc website. Dress and Dance like a Bride; be the wedding planner in this game and plan your dream wedding! Help the couples in this game to plan the perfect wedding. Focus on the details, as they are important in this game. You need to plan the perfect wedding for each couple and keep them happy. In this game, you need a to-do stating the wedding-related tasks—from dressing up the bride and bridegroom in the makeup salon to doing their makeup with the help of the salon beautician, plan the wedding buffet and many more! Complete the mission given to you to get several ideas for your wedding. You need to go to different caterers and bakeries to design the wedding buffet for the weddings. Decide on a wedding venue and pick a DJ for the music. In order to make them feel refreshed on their big day, take the couples to the spa for a relaxing time. Plan the whole wedding party—dress up the brides and the bridegrooms, organise the wedding venue, the buffet, the flowers and many more! After the dress up, it is time for the couple to head to the salon for their makeover. It is time to unleash your amazing makeup skills! Take care of the wedding party by looking over all the important things at a wedding. After the wedding party is over, send the guests 'Thank you' notes, thanking them for their time. You also get to keep an album of all the weddings you have planned. Find out more about this bridal makeup game on the Tabtale website. Take a tour of how grand an Indian wedding can be by playing this game. Moreover, this game comes in two parts. This game not only gives you an experience of how a real wedding can be but also how the pre-wedding rituals go. This bridal makeup game lets you deal with makeovers for both the bride and the bridegroom, the traditions and the customs, in determining the fashion and the style by blending in the ethnic and the modern together, the wedding preparations and rituals starting from pre-wedding to post-wedding. So, help the bride and the groom with their wedding and get an opportunity to jot down the ideas to create your own fairytale wedding! This game focuses mainly on the pre-wedding rituals like the engagement. This game will help you to plan for the pre-wedding rituals before your big day. You can even create your own ethnic style engagement decorations—from the spa, makeup ideas and mehndi designs to selecting various ornaments and garment for your big day. 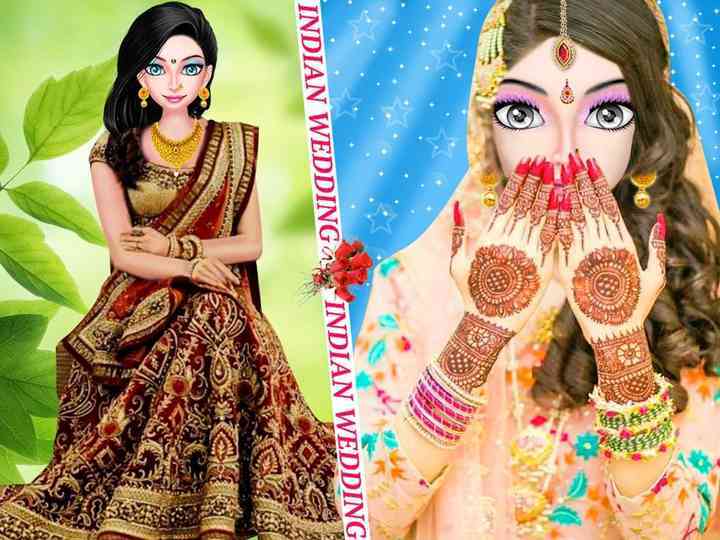 This game also features ring decoration, nail salon, photo shoot, mehndi, sangeet ceremony, bridal dress-ups and themes. Find out more about this bridal makeup game on TabLab. This game helps you in getting tips for your ultimate fashion makeover on your big day! From face spa, mehndi, groom and bridal dress-up, makeup to engagement and sangeet ceremony, this is the appropriate app to give you tips to prepare for your big day. Therefore, download and make use of these bridal makeup games to fulfill your desire to give a makeover to a virtual bride before your own wedding and utilise the tips on your big day! Which one would become your favourite?